WAFFLES: Oh my COD, Boss! Where's my orange furs??? Did you turn off the color? Who turned off the color??? WAFFLES: But, but... you're all black & white! KATIE: Yeah? Maybe you haven't noticed, but I'm ALWAYS black & white. What with the whole tuxedo cat thing and all. WAFFLES: Tuxedo? No one told me I had to dress up. KATIE: Waffles, just try and look sophisticated, glamorous. ...wait, who am I fooling. Just try and keep your mouth closed and your paws to yourself. Hopefully the camera will take care of the rest. WAFFLES: Ok, Boss. How's this? My mouth is closed. Just like you told me. KATIE: Not bad, Waffles. Pretty good posture.You're no supermodel, but that'll do. How about something a little more moody? 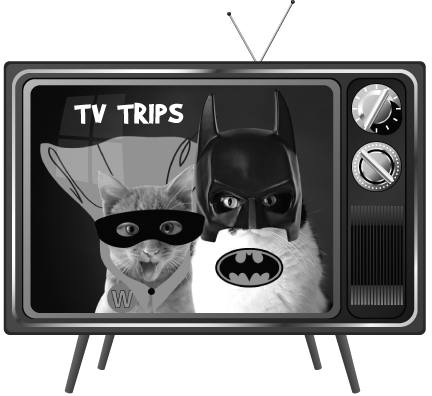 BATCAT & WAFFLES TV Trip! We've DVR'd it for you. 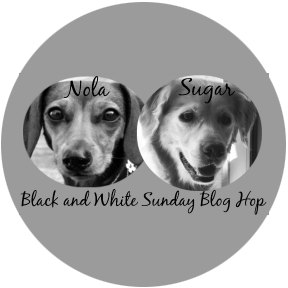 We're joining the Black & White on Sunday blog hop today. It's sponsored by Dachshund Nola and Sugar the Golden Retriever. Swoon! 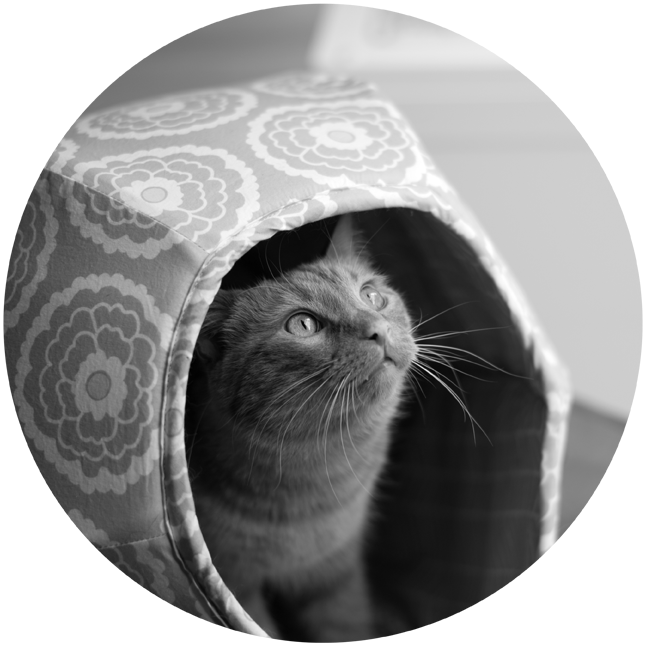 Waffles, you make our Meowm swoon even in black and white! Miss Katie, you look fabulous!!!!! bwa ha ha ha ha haaaaa!!!! You look great in B&W! 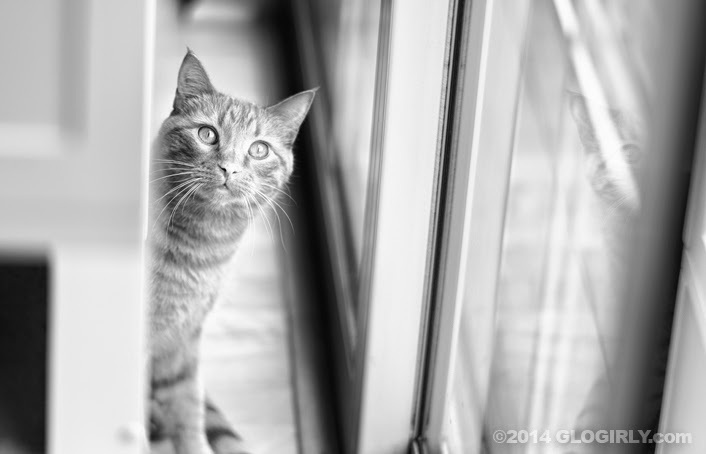 Waffles does cut quite a figure in black and white! My human says if you are going to make the Black and White meme a regular thing, you HAVE to do a cat noir story - that, at least, is a bit of vintage pop culture she knows! Katie, dear, remember to use a color stripper before adding on what colors you like, otherwise Waff will just turn.. uhm.. orange. Y'all look good in b&w ... Waffles, your orange will return! I'm always in the mood to visit Katie and Waffles! Lovely pictures! For one day, you're not the orange menace, Waffles! You look orange to me Waffles! Katie, you always know how to rock the most elegant black and white. Glad I subscribe to you because you weren't on the list as pawticipating on the B/W hop. 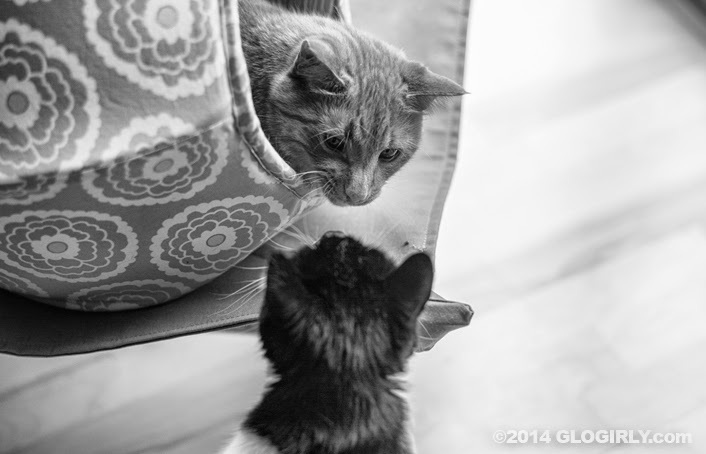 Absolutely love the photos in black and white. Just when I thought Katie couldn't get more beautiful, I think she did. You both look good in black and white. But the mom bean misses your ornj furs Waffles...she lubs her an ornj kitty! You rock black & white Katie. 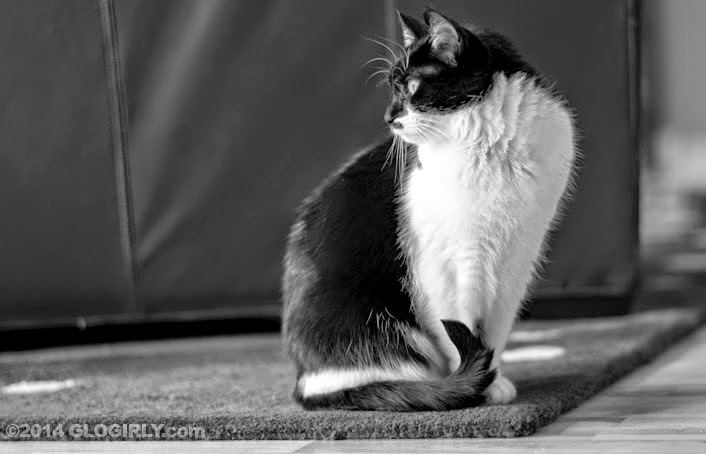 Katie may always be rockin' the black and white, Waffles but it sure makes you look handsome, my pal. 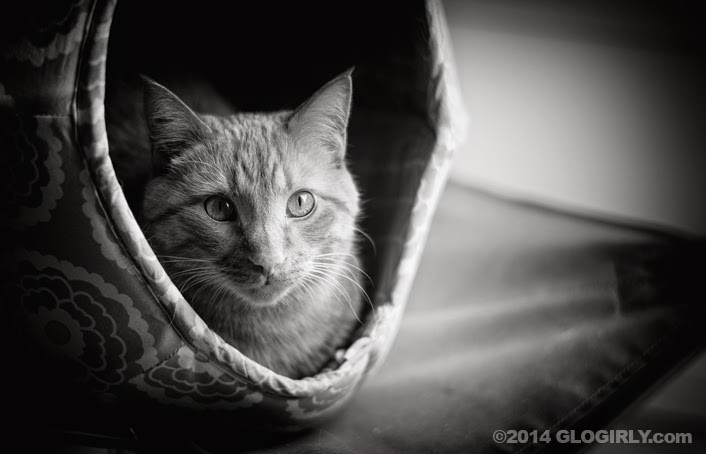 Waffles you may be a blaze of orange but we do like you your black and white images! B&W looks good on you!!! So waffles, when yous is black and white, is yous white with black stripes, or black with white stripes? 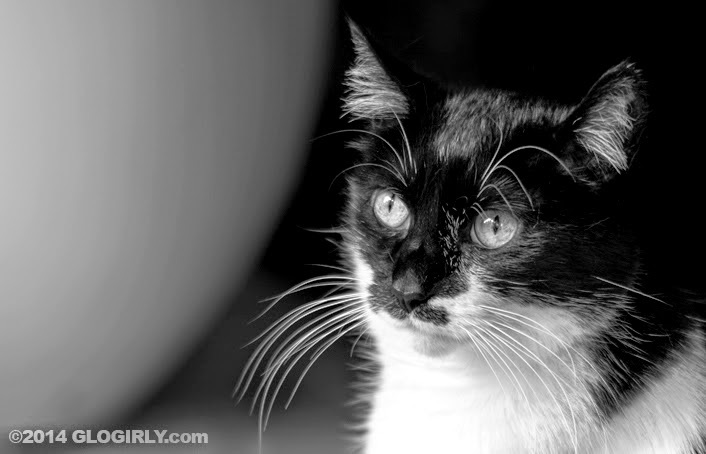 Beautiful cats and wonderful black and white photos! Tuxies rule! Do you know when TW was a little girl, they only had black and white? I’ll be their computers didn’t even have retina display. I think you both make great models! But no one can beat Katie's glamorous tuxedo! Waffles I think we look better in our normal Orange! Boss is just jealous and so are my brofurs! Meez finks yous boff look gawjus. Allie: I agree, Katie. Nothing sells it like classic black and white. We grey tuxies look equally stunning in the genre.